You won't want to miss 7eventh Time Down's Brand New Day concert with Jason Gray and Cloverton live. Come to this FREE event, May 4, 7:00 p.m. at the Linn Park Amphitheater. Jason Gray will also be at the Linn Park Amphitheater with 7eventh Time Down and Cloverton. Isn't this a great song? It has over 15,000,000 views on YouTube! Cloverton is coming to Martinsville on May 4 with 7eventh Time Down's "Brand New Day Tour." If you haven't heard their music, you might want to listen to this. You won't want to miss the opportunity to see them live! You won't want to miss the Concert/Night of Praise with 7eventh Time Down and Jason Gray on May 4 at 7:00 p.m. It's FREE and there will be food for purchase so bring your family, friends, and neighbors. (Don't forget your lawn chairs and/or blankets.) 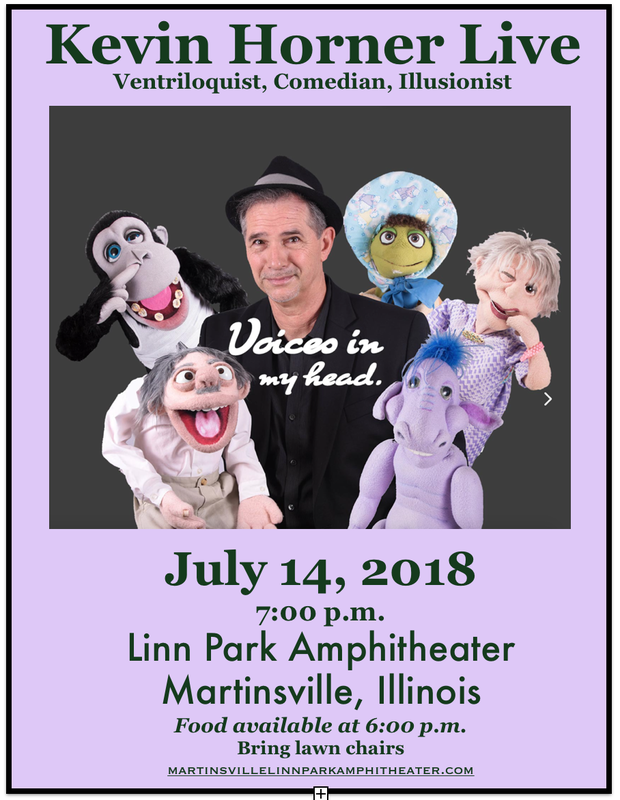 This is a perfect opportunity to enjoy a picnic while listening to great, inspiring music in the beautiful setting at Linn Park. 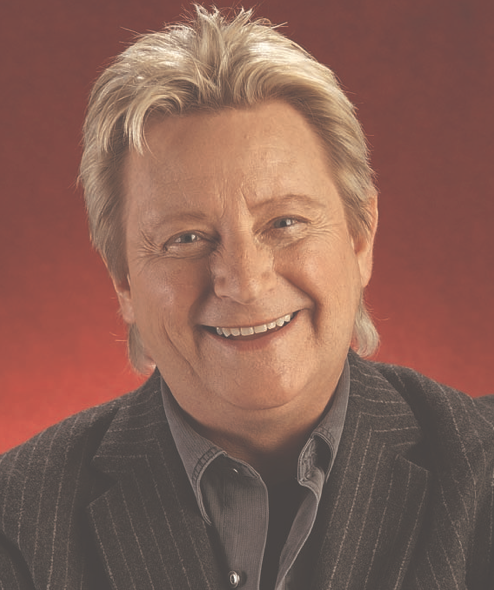 In case of rain, the concert will be held in the Martinsville High School gym. As you can see our 2019 schedule is almost complete. We are excited about the events! One new series of events that has been added is the first Sunday of the month "Night of Praise" which has been named Elevate Praise. 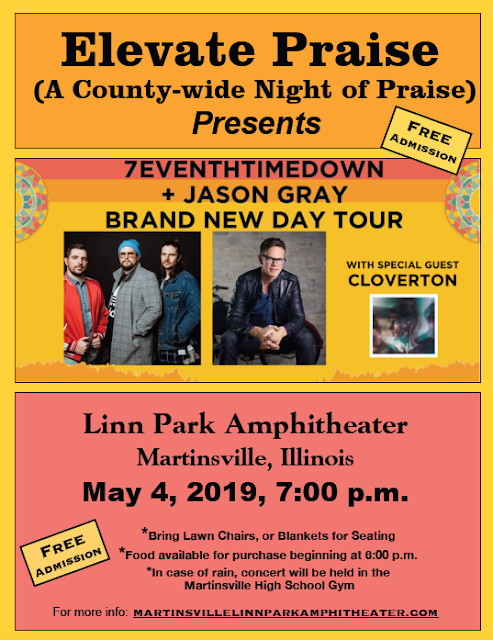 To kick off these Sunday nights, we have scheduled 7eventh Time Down's "Brand New Day Tour"with Jason Gray on Saturday, May 4 at the Amphitheater. This is a larger event than we have scheduled before, so we need your help in advertising. Please spread the word through word of mouth, Facebook, Twitter, or any other way you can think of. A Facebook page for Elevate Praise is being created to help in this. If this concert is successful we hope to entice other name groups to perform at the Amphitheater, also. 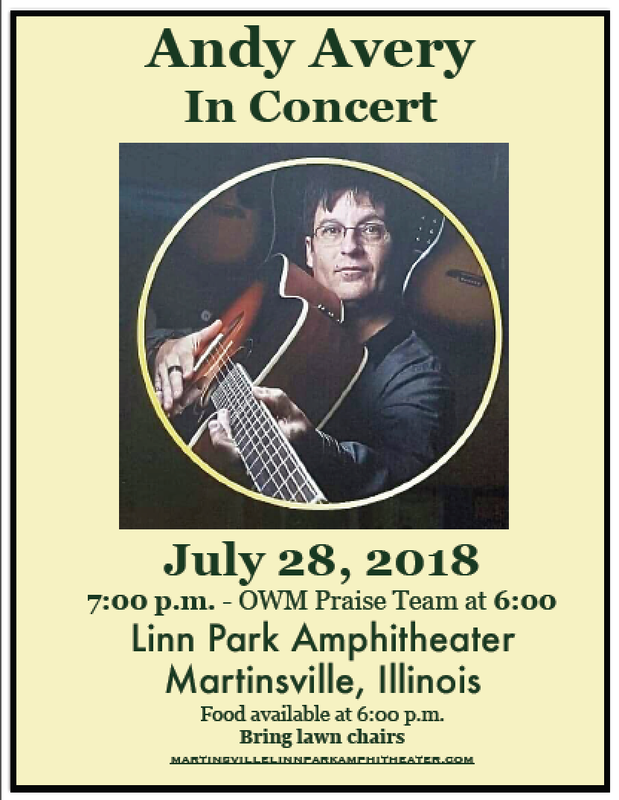 Please mark your calendars for a fun summer of entertainment and for exciting nights of praise.